The new Chamber chair values business, community, innovation and creativity. Len Rhodes. Photo by EPIC Photography Inc.
With roots going back to 1889, the Edmonton Chamber of Commerce has a long history of developing and influencing the city’s business landscape. Standing strong and advocating for business throughout the economic impact from both World Wars, the Great Depression, the discovery of oil in Leduc and several energy-related boom and bust cycles, the Edmonton Chamber is now one of Canada’s most influential business organizations. The Edmonton Chamber of Commerce’s board is chaired each year by a successful, charismatic, influential, business-focused individual, and 2018 is no exception. This year, Len Rhodes, CEO and president of the Edmonton Eskimos Football Club, is excited to take the chair and bring his signature enthusiasm, passion and drive to the role. Rhodes joined the Eskimos in 2011. He’s proud of the fact he runs one of the very few football clubs that operate as a not-for-profit organization. Winning the Grey Cup in 2015 ranks among the top five things to occur in his lifetime. Another career highlight is Northern Kickoff, where the Eskimos played in Fort McMurray in what would become the two most northern games in the history of the football league. Rhodes is also pleased about the opening of the Edmonton Eskimos Sports Bar at EIA, and he is thrilled that Edmonton is hosting the 2018 CFL Grey Cup. “The last time we hosted the Grey Cup was 2010, and it sold out in six days,” he smiles. “From a business standpoint, we estimate that the 2018 event will generate $80-$100 million in economic impact. In 2010, hosting the game in Edmonton generated $75 million. 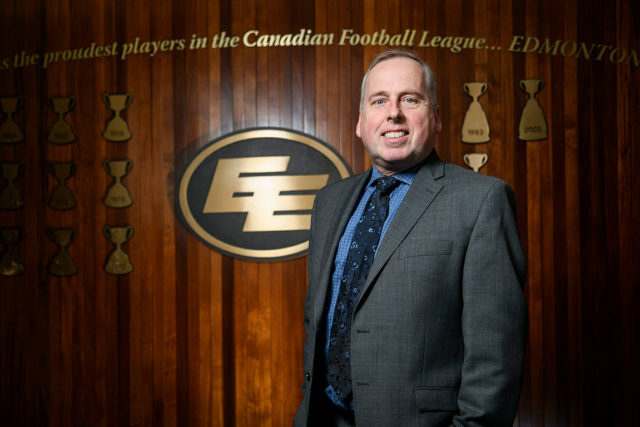 What makes the timing so great is that this year’s game will coincide with the 40th anniversary of Commonwealth Stadium, and the 70th year of play of the Eskimos.” Rhodes will be co-chairing the Grey Cup game alongside Brad Sparrow. Always focused on bettering the community, Rhodes is also involved in a large variety of charitable initiatives, including ending domestic violence against women, creating awareness for cancer and supporting amateur football. In November 2016, Rhodes’ life was changed forever when he was diagnosed with prostate cancer. Running one of the most beloved sports teams in the city, however, isn’t without controversy. Rhodes, never one to shy away from tackling difficult and sensitive subjects, handles this side of sports management with tact and diplomacy. Right now, the topic on everyone’s mind is the Eskimo name controversy. Rhodes meets routinely with Natan Obed, the president of Inuit Tapiriit Kanatami (ITK), to discuss this and other matters pertaining to the respectful representation of the Inuit people. “This is important because things are being introduced at a very fast pace,” notes Rhodes. “After spending 11 years in the beer business, my own experience and personal assessment as I’ve travelled throughout the country is that the private business model is the one that works best. The Chamber is very pleased that the government adopted a private model. The model is consistent with Alberta’s liquor system, which is very efficient. Private businesses are ready, able and willing to take on the challenge. This decision benefits business and government. Let businesses do what they do best. “I feel like a nerd when it comes to cannabis, but I’m an expert in the beer industry! When it becomes legalized on all fronts, the private retail model is the optimal model. Discussions like this will be ongoing for Rhodes in his role as Chamber chair, but he has plenty of experience behind him. In 2015, he became a director in the Chamber. He was asked to join after seeing the Chamber members in action at a social Eskimos event, and it didn’t take long for him to decide to align himself with the historic organization. Since joining in 2015, Rhodes has chaired the finance & risk, and policy committees. “What I love is the diversity on the board, based on skill sets, business representation and a healthy balance when it comes to gender,” he smiles. There are many things he’s looking forward to in his role as Chamber Chair. “The board’s role is one of governance, financial sustainability and blessing and influencing the strategic direction of the organization, all while removing barriers in business and creating a strong business environment that allows our members to prosper. Creating value for our members is one of the most critical areas. 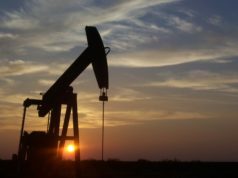 “There is a new economic reality in Alberta: new taxes, a 48 per cent increase in minimum wage, new costs from the carbon levy, potentially higher employer premiums with WCB and increases in corporate taxes at the federal level. All of this creates a huge burden on business. The Chamber will be a strong voice and will stand up for its members’ needs. “Given my hectic schedule with the Canadian football league and co-chairing the Grey Cup, one of my challenges for 2018 will be giving everyone the attention they deserve. All my time management skills will be coming into play. To some people, this schedule appears to be overwhelming, but to me it’s downright exciting because each aspect of it complements the other very well. In addition to supporting existing businesses, the Chamber supports the upcoming generation of business leaders. Rhodes knows there are some members of the business community that have not yet joined the Chamber, and he encourages them to consider membership. “Your Chamber is pro-business,” he says. “Consolidating all of your needs into one major voice can go a long way. As a member, we can serve you best. We are the voice for small business, medium business and large business. Our business is your business. Your business is our business. As he looks forward to the busy year ahead, Rhodes can’t help being enthusiastic and excited about all the possibilities.